Police are seeking three men they believe are connected to a "knockout game" attack that left a 53-year-old woman injured. 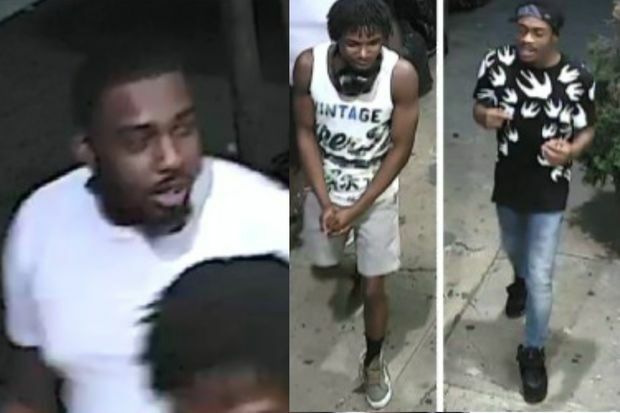 LOWER EAST SIDE — Three men were involved in a "knock out game" assault that left a 53-year-old woman bleeding from her face, police said. The 53-year-old victim was walking south on Essex Street between Grand and Hester Streets around 9:41 p.m. on Sept. 25 when one of the men came up behind her and punched her in the right side of her face, knocking her to the ground, police said. The man declared, "I'm gonna do it" before striking her, according to a police report. The woman's face was swollen and bleeding after the attack, according to authorities. 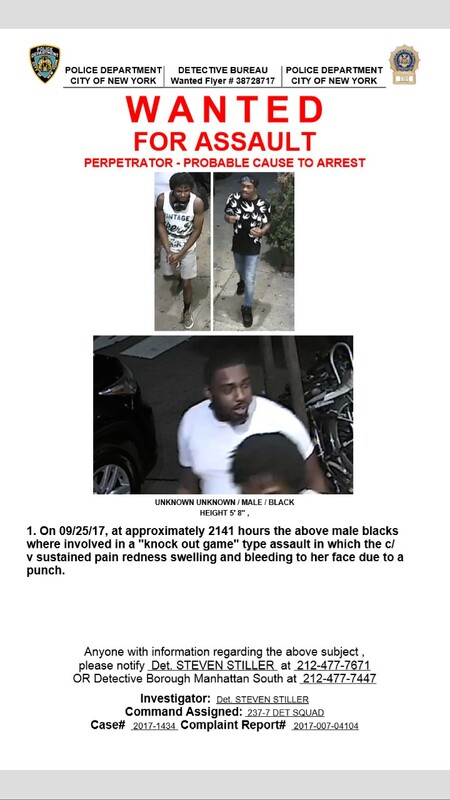 The Seventh Precinct, where the attack occurred, has released a wanted poster with surveillance photos of three men they believe were involved in the assault, classifying it as a "'knock out game' type" attack. Authorities characterized it that way since the suspect ran up and punched the victim in the face without attempting to take anything, police said. Authorities could not immediately say which of the three men had attacked the woman. Reported instances of these types of assaults, in which an assailant runs up to the victim and tries to knock them out before fleeing without take anything, swept New York and other cities in 2013. A string of alleged "knock out" attacks targeting Jewish residents of Crown Heights that year led to the arrest of four children. However, authorities at the time struggled to determine whether the "knock out game" was an actual phenomenon or a myth, according to reports in the New York Times and Reuters.